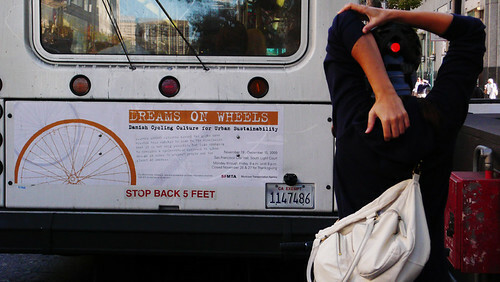 Like this cyclist, I keep noticing this ad on the back of Muni buses. So I thought it was time to investigate. Looks like a trip to City Hall in the next week is in order! Dreams on Wheels is currently riding towards San Francisco City Hall’s South Light Court. Open weekdays from 8 a.m. to 8 p.m., except for 26 and 27 November. The exhibit will coincide with the United Nations International Climate Conference set for 3-14 December in Copenhagen. The San Francisco Municipal Transportation Agency (SFMTA) in conjunction with the Embassy of Denmark , Washington, D.C. will bring the acclaimed exhibit Dreams on Wheels to San Francisco City Hall beginning November 19. Developed by curator Thomas Ermacora in collaboration with Danish architect and urban design consultant Jan Gehl, Dreams on Wheels showcases Danish cycling culture and Denmark’s commitment to sustainability via urban design that promotes active transportation. The Dreams on Wheels exhibit has made an international journey, most recently stopping in London and Portland, Oregon. The exhibit merges urban cycling culture, design intelligence and environmental consciousness and features case studies on how cycling has affected Danish culture. It also considers the history and social development of biking as a viable transportation alternative. I went to see it the other day and it wasn't there! There was a Toys For Tots thing going and no evidence of the exhibit. I wonder if it left early? I just went yesterday and had trouble finding it too. I thought it would be in the Gallery area where the usual exhibits are held. It is in the SOUTH Light Court - just off the main rotunda area on the main/first floor. I actually was a bit disappointed by the exhibit. It is a lot smaller than I thought. I was expecting large poster prints of Mikael's and Lars' photography; no such luck. You should go back and see what you think.